I know a lot of people are in recovery mode from Thanksgiving. I have been hearing that TODAY many are ready to get back on their exercise and eating right before Christmas so they on't gain too much weight before the new year. THAT IS SO GREAT! Because you are not alone if this is your goal and EXACTLY why I am running a HEALTH UP YOUR HOLIDAY December support and accountability group! I want to help you reach your goals. To help you LOSE weight before Christmas so you can have a happy and healthy GUILT FREE Christmas. To help you with that, Today, Monday November 28, is the last day to receive my FREE OFFER. 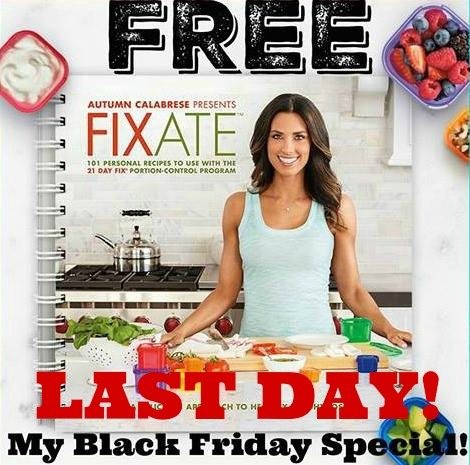 When you order a workout combined with Shakeology I will personally send you a FREE COPY of FIXATE, Beachbody's first cookbook with 101 easy to follow yummy recipes to help you keep your nutrition started right! AND A FREE COPY OF FIXATE! YOU DO NOT WANT TO MISS OUT ON THIS OPPORTUNITY to help you get healthy before the holiday and set you up for the new year and continue your progress! Send me an EMAIL or message me on FACEBOOK!